Does "mad" apply more to people working in advertising or staying home with their kids? I'm finding out. It happened. Noah started kindergarten. But there were all the other hours, too, which sometimes felt endless: Noah whining that he was bored, or screaming that Rory was touching him, or collapsing in hysterics for no discernible reason. There were the impassioned but illogical arguments through the bedroom door while he languished in time-out, and the nonstop questions about everything under the sun (as well as things in the outer reaches of the sun, like the Voyager 1 space probe, which thanks to Noah I know all about). At those times, I was ready for him to be in school all day. And it seemed clear that he was ready, too. Of course, to paraphrase the saying, the summer days were long, but the months were short. June was busy with camps and swim team. The next two months were a little less scheduled; we traveled in July, we had visitors and a week of Lego camp the next month. As August crept on, my energy waned and the hours of TV the kids watched on any given day crept up. 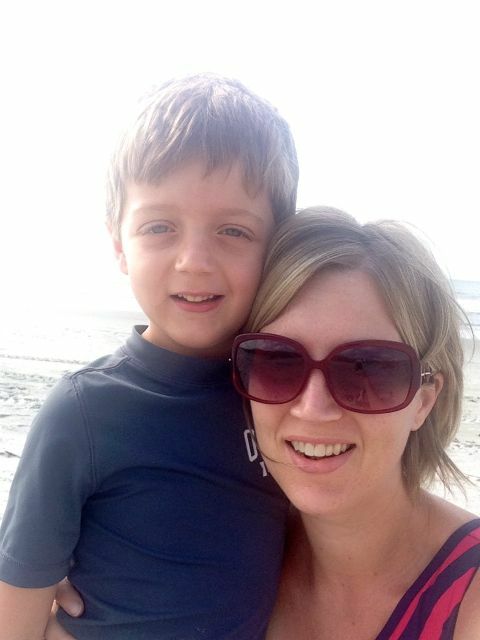 But there was hope, a light right before the light at the end of the tunnel: in the last week of August, when most kids had gone back to school but Noah was on a one-week delay for kindergarteners, we went to the beach. It was nothing fancy. We stayed in an outdated but comfortable condo right on the water, ate peanut butter sandwiches for lunch and scrambled eggs for dinner. When we weren’t on the beach, the kids reveled in the cable TV (which we don’t have at home), and Pat and I ate Oreos and drank beer and became obsessed with finishing a puzzle that Noah had started and abandoned within ten minutes. 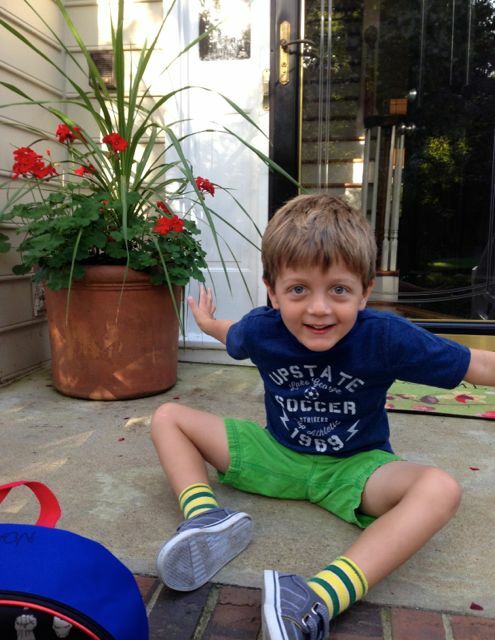 But the trip felt like the big reveal of something I had seen flashes of all summer: Noah is growing up. He’s gotten tall and lean, his thick, coarse hair bleached in patches by the sun, little muscles starting to show on his calves. 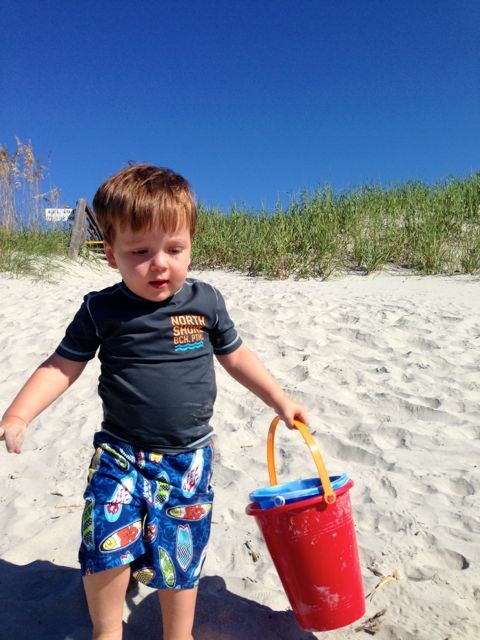 The first morning at the beach, Pat hung back with Rory while Noah and I took boogie boards into the ocean. At first, I was nervous to let Noah stray too far from me. But after a few minutes, I realized I could relax a little. And there we were, each trying to catch a wave and riding it to the shore side by side. It was the first time I felt like I was doing more with my kids in the water than just hanging onto them for dear life. Of course I was vigilant; he’s still a five-year-old boy. 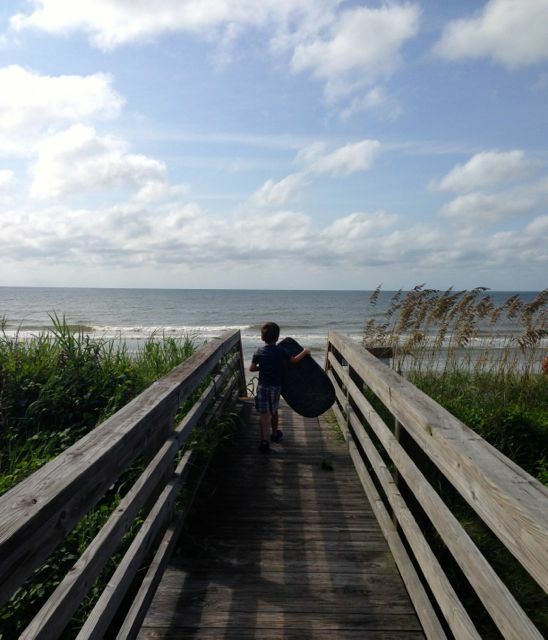 When he tired of boogie boarding, he begged me to wade deeper into the water with him, where he would alternately karate chop, Hulk punch or Wolverine slash the waves. 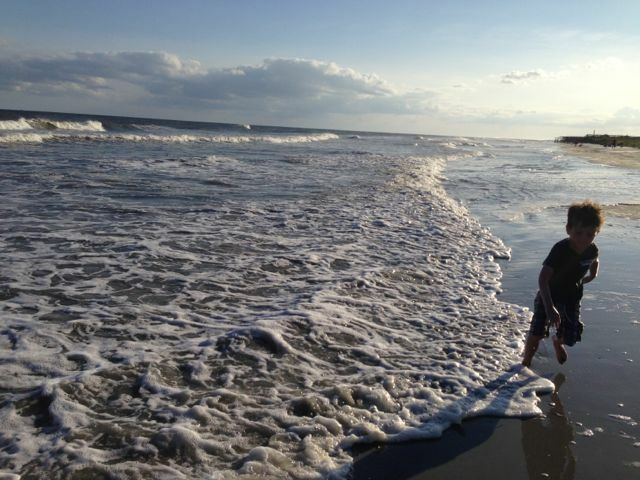 Sometimes when a big wave rolled toward us, he’d reach for my hand. But I was surprised by how often he remained independently steady. He was careful, but he was brave. The trip was abbreviated; we had only four days before we had to get back for Noah’s school assessment and Rory’s preschool orientation. But those four days prepared me for Noah’s first day of kindergarten in more than just the obvious ways of family bonding and relaxation. 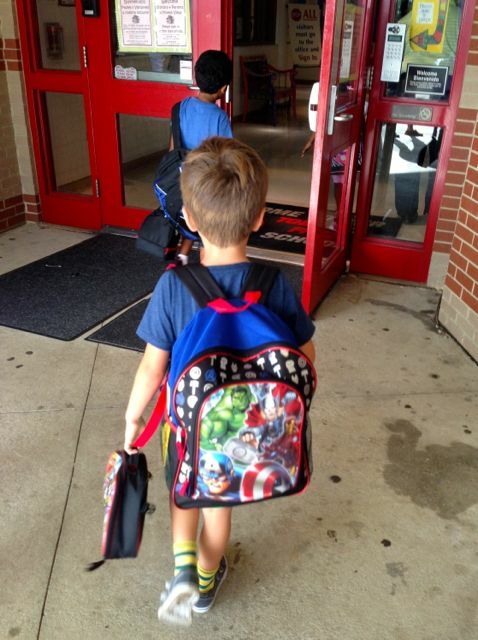 Yesterday, I checked and re-checked Noah’s school supply list and carefully packed his Avengers backpack. I made his lunch and labeled his snack. I laid out his first day of school outfit, remembering that they have PE on Tuesdays and needed to wear sneakers, which Noah hasn’t worn since May. We had a special “last day of summer” dinner of hamburgers, french fries and frozen custard from a new fast food restaurant near our house (which is going to be the death of all my healthy eating intentions), gave baths, let the kids watch Curious George and Wild Kratts and headed upstairs to bed. At dinner, Noah had asked if I could stay with him for his first day. But after I told him no, that wasn’t possible, he showed no other signs of nerves. I, on the other hand, lay awake well after we turned off Fallon (though this could partially be due to the Oreo and chocolate custard concoction I ate at 10:00). Would he go in without crying? Could he handle the long day, nearly twice as long as preschool had been? Would he be able to get his yogurt tube open in the cafeteria? How would he know where to get off the bus? But this morning, he bounded into our bedroom, ready to go. “I went to kindergarten from 1983 to 1984,” I told Noah. “No it’s not!” I laughed. In the car, I chattered away, trying to calm my own nerves as much as his. I found the only open parking spot in the furthest corner of the lot. I loaded up Noah with his backpack and lunch and we trudged through the sweltering heat to the school. It wasn’t until we walked in that I started getting choked up. It’s a big school. I was glad that Noah let me take his hand. It reminded me of our week at the beach. Noah standing strong in the waves by himself. Those instances when I’d grab him, or he would reach out for my hand, but just long enough to steady himself. Long enough for me to know he was okay. Then he’d go back to karate-chopping the waves on his own. “I’ll lead,” he said now. When we walked into his classroom, several kids were already sitting at tables, coloring quietly. Everyone was calm, if not slightly dazed. The teacher showed Noah where to put his lunch and told him to sit anywhere he wanted. I set his backpack down next to him and kissed him on the cheek. He gave me a steady look. There was nothing left for me to do except to go. And to let go. To acknowledge that Noah is capable of more than I realize. To accept that there will probably be some bumpy spots – some water up the nose, some sand in the eye – but that those things are part of growing up. Of course I’ll be nearby, guiding him when the water is rough, reaching my hands out for him to grab when he needs to feel secure. 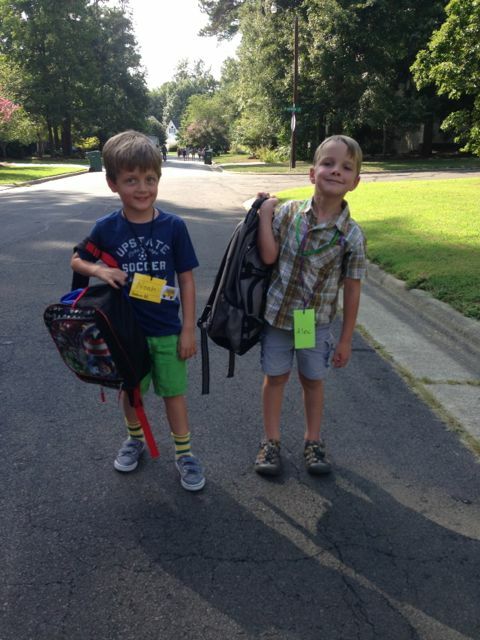 And if the smile on his face when he got off the bus in the afternoon was any indication, he did. Perfection! Life appears to be a ride that Noah will command with confidence. Oh this made me cry. Beautifully written. as usual! Noah obviously has great parents that gave him the confidence he needed. Great job Mom! Priceless! And I can’t spell- that’s why I never comment! I’ll always take comments with typos over no comments at all! You’re amazing and so is Noah (and Pat and Rory, too, of course). You have me in tears. After so any years of being on the receiving end of kids’ first day of school, you perfectly described how all of those amazingly trusting parents handed their kids off to me and as they instantly watched their child grow up in front of their eyes. Thank you. Awww, thanks, Heather! It’s such a big day for the teachers, too. What would we do without them there to calm our fears? I miss you, too!! Such a great one, Amy. I totally cried and actually feel like I want to keep crying as I think of being in your shoes in 2 years. Your kids couldn’t be cuter. Love love your writing! So sweet Amy! 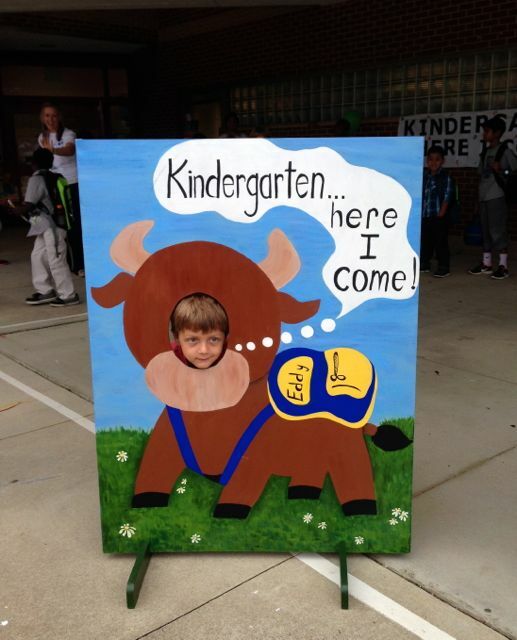 My little guy went to kindergarten last year…and I lost it. And I hate that you were in kindergarten in 1983. I was in middle school.